On Thursday, Megan Sugg graduated almost a month early from Glen Burnie High School in Maryland. The occasion, which featured the requisite robes, flowers, and speeches was more subdued than most high school graduations. Megan Sugg was graduating at the bedside of her dying mother. 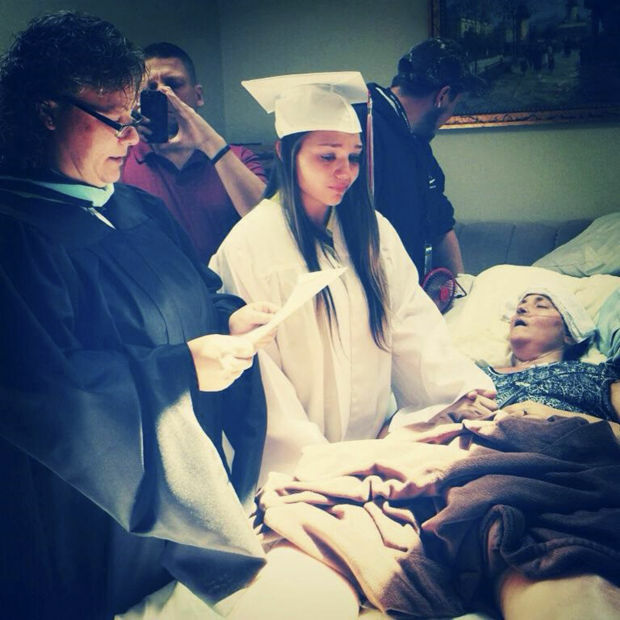 Seeing her daughter graduate was Darlene Sugg's final wish. Darlene Sugg, who had been battling cancer for four years, was in hospice care when her condition took a turn for the worse last week. As her situation became more dire it also became clear that Darlene might not live to see her daughter graduate high school next month. 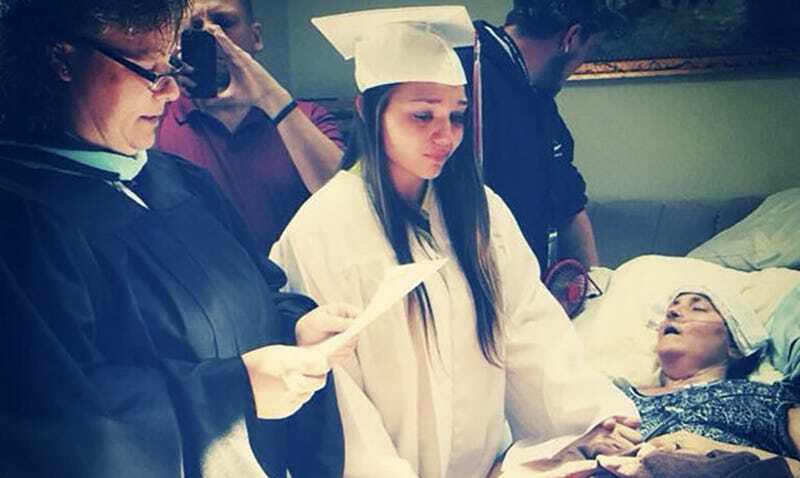 That's when Darlene's husband Steve took his daughter's high school up on their offer to create a special ceremony so that Darlene could witness her daughter attend commencement before she passed away. According to NBC, the ceremony didn't leave one person in the room dry-eyed. Faculty members came dressed in traditional robes, the principal read a speech she had written specifically about Megan, and Darlene — whose condition had deteriorated significantly - opened her eyes to take in the graduation. "My wife was glowing to see Megan graduate," Steve Sugg told NBC. Darlene Sugg was able to be a part of one more milestone before she passed. The day after the graduation she saw her daughter put on a gown and go to the senior dance. She died at 3:25pm the next day, after spending one last night holding her husband's hand. Speaking to NBC yesterday, Megan Sugg said that the graduation had been bittersweet for her. "I was glad mom got to see me graduate, but I was sad to know that was the last moment I'm going to have with her."